Many users who send PDF documents with sensitive data back and forth will password protect the files from their Mac so that only authorized users can read and access the data contained within the document. This is fairly common with everything from contracts to accounting and financial records, and it’s equally common to sometimes require the removal of the password encryption from that same PDF document. Re-saving a protected PDF without the encrypted password will completely remove the password from the new document, allowing it to be sent and viewed as normal without password entry. If for some reason this trick works (and there is no reason it shouldn’t), you can try to re-save a PDF with a keystroke which is basically sends the PDF creation process through the print function rather than Save As function of OS X. In a similar manner, you can use this trick to change a password on a protected PDF file too, simply by saving the file without a password, then re-saving it yet again with a new password. That may sound like a bit of work, but it’s a quick process, and certainly beats sharing a primary password with other users if you happened to have set one that wouldn’t be appropriate to share. Thanks to Jordan for the tip idea. This absolutely works but it’s not the most elegant solution, why isn’t there a simple “Remove Lock” option? I guess the password encryption gets embedded into the PDF as part of the file, right? So probably not possible. Anyway, easy to remove password locks from stuff like iCloud files and iWork, MS Word, etc. I don’t why but it didn’t work for me. I even tried the ghostscript method but I couldn’t remove the password and print, edit, copy and other restrictions from my PDF file. I asked my manager who gave me this locked PDF file and he told me that he don’t remember the password but he encrypted with the latest version of Acrobat. Luckily, I found this comment while browsing the Apple Discussions forum and it worked for me. I could finally get rid of these annoying print, edit, copy and other restrictions. So is there a way that I can unlock a file that I can’t remember the password for? You said “for most users” you have to have the password. Well this goes far beyond the reach of 99.9% of the population, but there are brute force utilities that attempt to guess passwords on PDF files and they may or may not work depending on the password strength. Something like a security or intelligence agency would be almost certainly be able to access data in a password protected PDF if they wanted to as well, so it’s not foolproof but it’s good enough for most users. Most users being the vast majority of every day people, not a situation where truly sensitive data is stored in a file which would be better suited for direct encryption or something similar. This is an awesome trick, thanks Neil! There are quite a few dependencies that will arrive with it, but this could be very useful all around. Really? Seriously? People that don’t know this are living in rainforest tribes. Yea really, this is an article how to remove a password from a PDF file. You bored Homer? Is Mr. Haaksik a regular troll here? In any case, I can see what he MAY have been referring to. People who get encrypted PDFs and think to themselves “there must be a way to remove encryption/password protection from this PDF” tend to be of a much more savvy user than the average consumer. And readers of this site, I would surmise, are a much savvier Mac user. So it stands to reason that this comes across as somewhat of a “duhhh! !” post. Or, maybe he was just being a d¡ck! Unfortunately yes he is a regular troll, while offering reasonable criticism or improvements to an article is absolutely OK (and welcome! ), any comments that are offensive or add nothing to the conversation get filtered out. I hear and agree with your (and maybe even his) larger point though, and this specific solution is just aimed at novice users who are not aware that perhaps the simplest way for removing the PDF password is to re-save it without one. Anyway, appreciate the feedback as always! Thanks very much for the tip! One of the things I appreciate about this site is the way in which it caters to newbies AND to readers with a more sophisticated understanding of the ins and outs of Macs and other Apple products. It isn’t unusual, while problem-solving, for a person to look to complex solutions when the answer is right there in front of them! In this instance, I did exactly that, so I’d like to thank you for the article! And when a person(s) chooses to be unpleasant for the sake of being unpleasant, filtering them out is appreciated. There’s just no need for that type of behaviour. Yeah I got my hopes up too when I read the subject line! 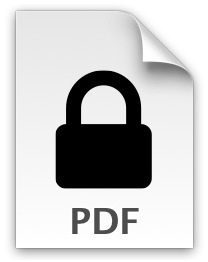 I successfully created a protected PDF document which I named “Test”. My Preview does not have a “Save As” function under the File menu, so this does not work for me and now I can’t get rid of my Test doc. I was able to select “Save a Version” in Preview from the File menu which placed an unprotected Test doc on my Desktop. Found a solution in Preview Help. Lock or Unlock document can be found in drop-down menu next to document title. That file locking feature is separate from the password protection / encryption of a PDF file. File locking is permissions based, basically changes a document to only be readable (+r-w) in the file system, easy to undo and won’t offer any protection. Yes – thank you for clarifying what I should have made that clear – but Unlocking the document (without Unprotecting it) did allow the document to be trashed. Learn something new everyday! Simple enough of a tick that I wasn’t aware of. This doesn’t appear to work any more. I just tried it and it required a password to do anything that was restricted, including saving, exporting & printing. What’s the trick? 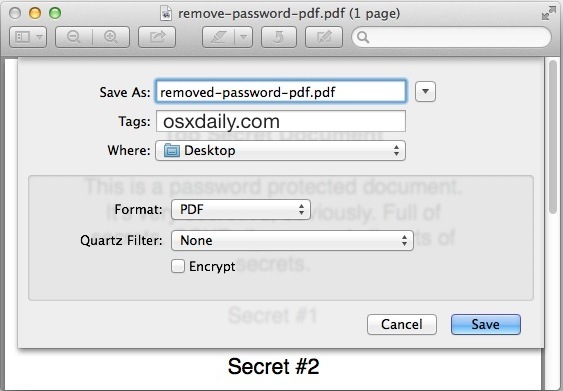 It works in all versions of OS X to remove the PDF password as you re-save it after entering the password that is locking the PDF document. Here’s a simple solution that worked for me. When you clicked on Export or Export as PDF, you might be asked for password. Your tips is anyway wrong. i wanted to add comments to a PDF which was protected against extracting/copying content and stumbled upon this tutorial. As I did not know the password, the tip here did not work – could not save it in Preview.app in OS X 10.6.8, neither could I print it to a PDF (all options greyed out except creating a PostScript file out of it). Thank you!!! This article just saved me a bunch of time and hassle. I’ve been using your site for years now. So much great info here! Awesome! It might seem like trivial information for some, but this little tip has just saved my bacon. Thanks for posting!